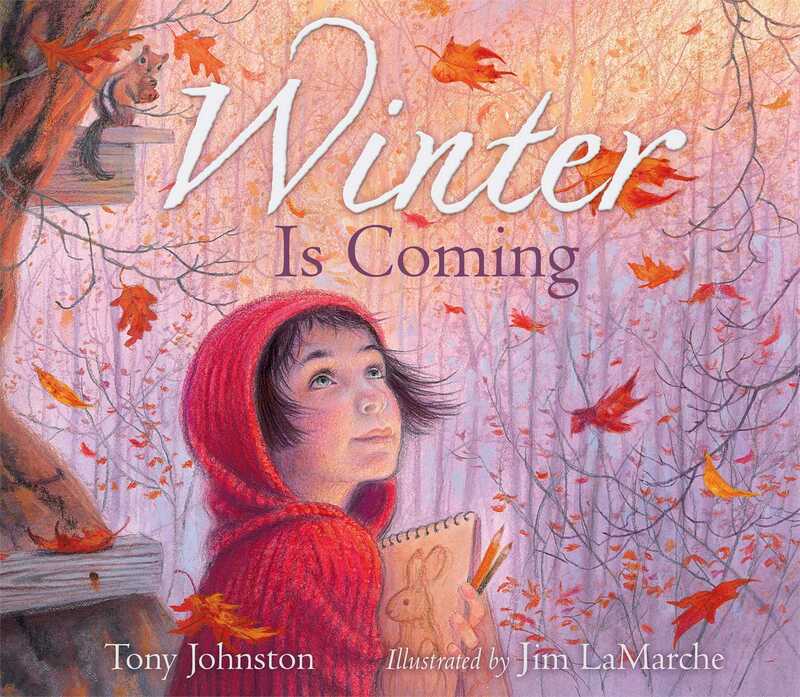 Witness the changing of a season through a watchful child’s eyes in this story of nature and discovery from award-winning author Tony Johnston and New York Times Best Illustrated artist Jim La Marche. On a cold September day, a girl takes her binoculars, sketch pad, and pencils outdoors to draw the wildlife around her family’s farm. She returns several times before late November, when the first snowflakes fall. Often observing from a platform in a tree, she sketches what she sees: a red fox, a bear with her cub, a lynx, a skunk family, woodpeckers, rabbits, chipmunks, a doe with two fawns, Canada geese, and wild turkeys. The geese are flying south, but the other animals are foraging for food as they prepare to winter in the woods and fields around the farm. Written from the girl’s point of view, Johnston’s text is plainspoken and natural sounding but poetic in effect, with graceful repetition: on most double-page spreads, the lines end with “Winter is coming.” Created with acrylics, colored pencils, and opaque inks, LaMarche’s captivating illustrations convey the radiance of an autumn meadow, the girl’s rapt attention to her surroundings, and the unique qualities of the animals she observes. Winter may be in the title, but this evocative picture book is best for reading aloud in the fall, when children can notice the subtle changes happening in their own outdoor spaces. A quiet, beautiful picture book to share. As fall winds down to winter, a keen-eyed girl quietly observes the animals’ prepa- ration from her cleverly situated platform in a tree at the edge of a meadow. She watches deer and skunks, and spies a fox and a lynx, as the season grows colder and the animals scurry to find whatever food they can to fill up for the tough times ahead. Though the text is lengthy, Johnston makes it work, demonstrating her authorial chops with ragged-right prose that moves smoothly between naturalistic observation and lyricism (the deer “nibble the brittle grass. They nibble at the edges of ferns. They nibble at nothing”); careful use of rhythm and the periodic repeti- tion of “winter is coming” help structure the account of the move through fall. The illustrations, employing colored pencil, ink, and acrylic paint, use the realistic figures of girl and animals as the centerpieces of creative compositions: viewers peer down on the flying Canada geese to see the girl looking up at them from below, or perch alongside her in a neighboring pine as she sketches some busy chipmunks. The tree’s curving limbs and solid trunk anchor hazy full-spread landscapes suffused with autumnal golds and russets. Literarily inclined youngsters will appreciate this as an entrée to a nature study unit or a field trip involving wildlife observation. An empty sketchbook, freshly sharpened pencils, and binoculars set the stage for this luminous story about the powerful magic of being still and experiencing the natural world. Sitting in her tree house, using all her senses to witness the changing season, a girl sketches a variety of Northern animals and notes their habits as they forage for food. The short journal entries combine poetry with pragmatism, resulting in spare, elegant observations about nature: ?Dawn burns the sky./A flock of wild turkeys jostles by./They poke everyplace, muttering/food, food, food.? Although the variety of animals that she sees within a single season is rather implausible, the respect she has for nature and the life cycle keep the text grounded: ?I know animals/are best left alone./Maybe the deer will find enough food./Maybe not./ Soon they move on, nibbling.? Gorgeous acrylic and colored pencil illustrations show the wonder that the girl feels and evoke the experience of witnessing the layers of the natural world slowly revealing themselves as apparent stillness becomes full of life—wind rustling leaves, birds chirping, and scurrying insects. This book unflinchingly faces the fact that the cold is coming, the lean season is approaching, and there are endings within the cycle of life. A touching reminder about the beauty of the natural world.